The Yellow-eared Parrot lives in the central Andes. Until recently there were populations in Ecuador and Colombia, but unfortunately the Ecuadorian individuals disappeared at the end of 1998. Shortly after, a population of 82 birds was discovered in Colombia, and on which the work is primarily focused. The main threat to the Yellow-eared Parrot is the cutting of the Andean forests because it has a close ecological relationship with the Colombian national tree, the wax palm, which has suffered a dramatic decline. Habitat degradation by human presence and the previous pressure of capture have worsened its situation. Conservation status: Category EN (Endangered) in the Red List of the IUCN. Restore the wild population until removed from the list of threatened species of the IUCN. At the moment, it has gone from being "Critically Endangered" to "Endangered", which is a major breakthrough achieved by the project. The strategies followed in the project combine research on the species and its environment, monitoring and follow-up of the population in Roncesvalles and Jardín, its two most important strongholds, along with social awareness and involvement of local communities. 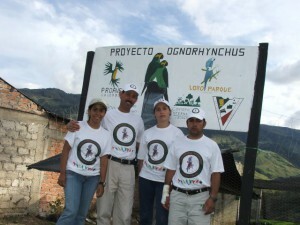 The establishing of protected areas and reforestation have also been essential lines of work. On the one hand, roosting counts have been made and the project has managed to record more and more individuals. In the last breeding season, nest monitoring allowed us to follow the development of 350 chicks. 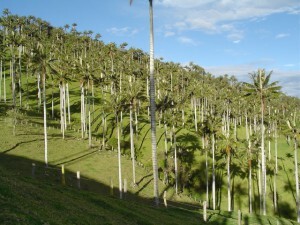 Work has also managed to recover 3,200 hectares of Andean forest, through production of seedling nurseries for important species in the diet of Yellow-eared Parrots, and the planting of 330,000 seedlings of trees and wax palms. A buffer zone of 4,490 hectares for a national park has been established, and another 4,900 ha of private reserves. Another important package of actions has addressed social awareness and outreach, both among students and also aimed at the adult population through media campaigns, festivals, ecological workshops and the mobile classroom "parrot bus". In just five years this is estimated to have reached more than 130,000 students and 5,000 adults from different communities.